I’m not the biggest fan of winter, but I manage to get through the cold months with some treats and a bit of decadence. In my humble opinion, the best part of winter is the license that I give myself to eat massive amounts of food with no shame! All’s fair in the quest to keep warm, right? Anyhoo, here’s my household’s favorite breakfast recipe these days. Or dinners. Basically, anytime is a good time for pancakes around here! This is the pancake recipe that I use most often. 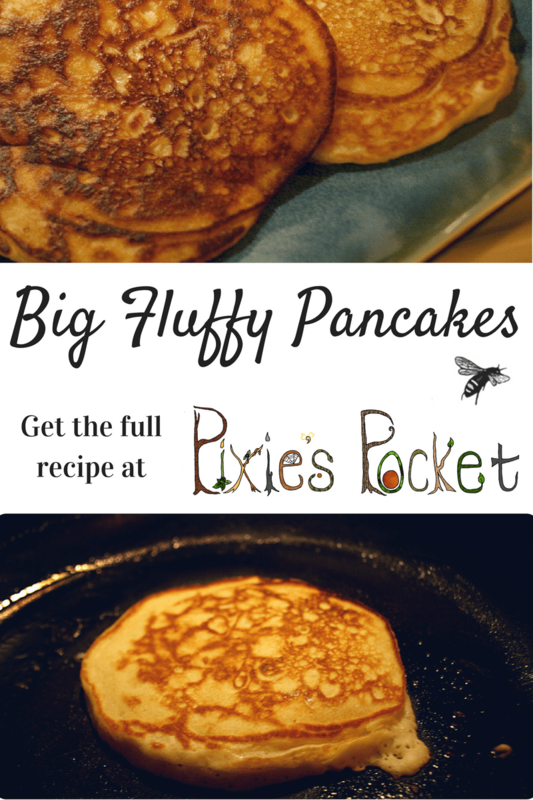 These big fluffy pancakes melt on your tongue but are so warm and filling – enjoy! In a large bowl, sift together the dry ingredients: flour, baking powder, salt, and sugar. Make a well in the center of the dry ingredients and pour in the milk, egg, and melted butter. Whisk or stir it until it is just smooth. Heat your griddle over a medium-high heat. I add a little swipe of butter to my pan just before I pour each pancake, but that is totally optional! Pour or scoop about ¼ cup batter onto the hot griddle. Let it cook until the edges begin to firm up and bubbles start appearing in the middle of the pancake. Flip it and cook for another minute or so. Remove from heat, and serve hot! Want to try a variation on this theme? Check out my recipe for Strawberry Oatmeal Pancakes for a sweeter, heartier breakfast! Try covering your pancake in jam or jelly, or drizzling a fruity syrup over it, or a whipped honey butter!